Never lose your items. 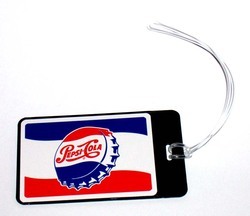 The front of this tag features a Vintage Pepsi ad product. The back has a name/address/phone number/email customizable insert. This great luggage tag measures 2 5/8" x 4 3/8"and includes ID tag and vinyl strap. Just fill in your info so that you bag will never be lost. This tag can be used on purses, makeup bags, video game bags, luggage, brief cases, attache cases, book bag and lots more.